December 2015 - Deb Arnold, Ink. 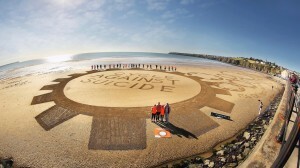 The title and subheader of this post may seem incongruent – celebration and fighting suicide? But this seeming contradiction is, in my view, one of the reasons why Cycle Against Suicide (CAS), a two-week bike ride around the island of Ireland and related events, has been such a tremendous success. Speaking as someone who’s lost a dear one to suicide and who inherited chronic depression (and who strongly believes that combating both requires talking about them as they are – a normal part of everyday life for one in five of us), what’s magical about this organization is that it’s not doom and gloom. It’s not darkness and shame and whispers. It’s bright orange cycling jerseys, balloons, face paint, you name it. It’s upbeat music. It’s community and openness, acceptance and understanding. It’s helping young people to talk about how they’re feeling and to be aware of friends who might be having a hard time. 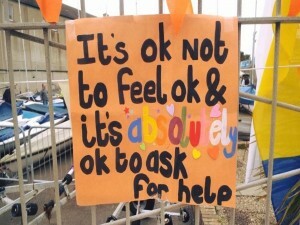 Their slogan, “It’s OK not to feel OK, and it’s absolutely OK to ask for help,” is simple and brilliant. I was fortunate to become involved with CAS through Jim, supporting his TEDx Talk in Northern Ireland pro bono. And since I’m hands-on and love to travel, I just had to be there. That enabled me to attend two CAS school events and the first Orange Tie Ball. Throughout, I met amazing people fighting the good fight to reduce stigma and the terrible isolation that can accompany depression, and can make losing someone to suicide all the more painful. It was inspiring and fortifying, and I got back far more than I gave. Thank you to Jim and your vast orange army of volunteers. You make this fight a true celebration of life and hope.